More work done yesterday - I finished decaling the last six NY&NE cars (and went back and 'fixed' the first six heralds that came out badly), and got the cars situated on the layout with car cards and waybills. As expected the layout swallowed them all up like nothing. Oh, well. I also got some more work done on some of the cast gondolas I wrote about last week. I sanded the putty Wayne had applied on Wednesday and re-carved in some details, I also scraped off some of the primer paint to adhere the needle beams to the bottoms. I also scrounged up parts for four more of the old 28' resin gons, and got them built up. So over the next few days I suppose I'll be gluing on a lot of queenposts and bending a lot of truss rods for these cars. I need to order a bunch of brake wheels to outfit these cars and a lot of the last bunch too. I heard B.T.S. models sells some good ones, I'll check them out. On Saturday I also had the pleasure of having Neil over after what seems like months since he was last over. He gave me a hand by going through Dock Yard and putting in extra ties and spikes on many of the turnouts to better support the stock rails. 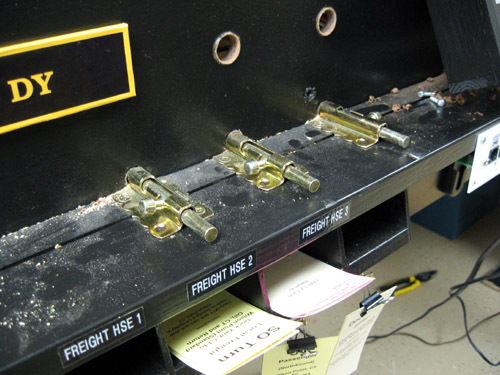 He and I also put in a Dock Yard switch machine and set up another two linkages, leaving me with only two left to go. I'm certain that everything will be in good shape for the next op session now! Last couple of days I've been spending a lot of time on paperwork, getting ready for the Op session next month. I already had a timetable, but I needed a number of other things as well to run under timetable and train order rules. Things like a rulebook, train order forms, clearance cards, and other stuff. Well I'm not done yet, but a lot of what's now ready can be seen on a new web page here called Paperwork. Most of the forms were done in Microsoft Excel, the text stuff in Microsoft Word. I've prepared PDF copies of each for for the website so anyone can view or print them out. The rulebook is based on a 1953 text, somewhat altered to take into account the earlier era (for instance, all references to diesel electric locomotives were removed), and some changes made to incorporate other features of the early period. 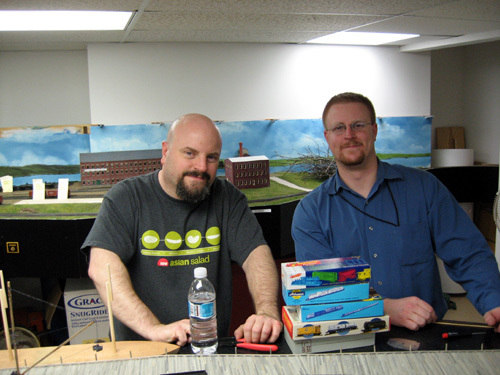 I only included the rules I felt were important for model railroaders to know in order to get through a TT&TO session. I also included a section of special instructions, which deal conversationally in useful facts, tips and tricks on getting through a session here. I sure hope my operators read up on this, it will really help things go smoothly if they do. Along similar lines, I've peen pondering some other operational issues as well. How does one know if the train that's passing you as you wait in a siding is the one you are waiting for? It could be an extra train, and if you venture out onto the main a cornfield meet with the scheduled train you were waiting for could be the result. Well, tiny flags are difficult to attach to an HO scale locomotive and hard to see too. 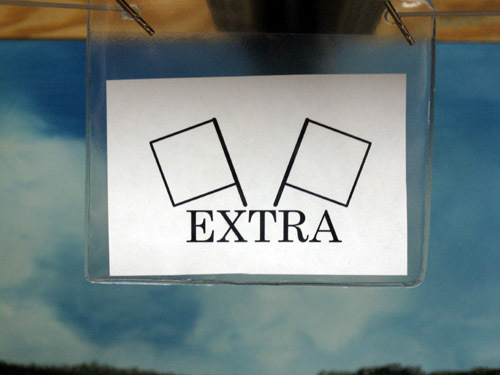 So I had this idea to hand out a badge when an operator of an Extra or Section picks up his train that has two flags printed on it and the word "EXTRA" or "SECTION" clearly written on it. (Sections would have green flags.) The operator wears it around his neck on a lanyard as he drives the train around, making it easier for other trains he meets to help identify him. I intend to try it out at the next session and see how it works. 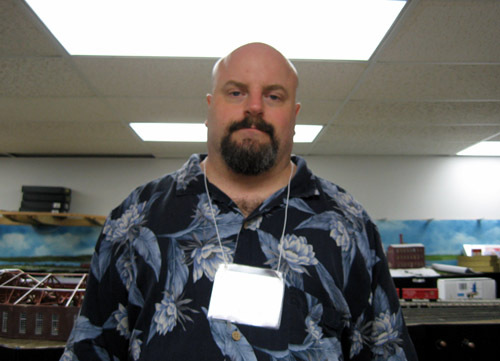 Below is a picture of me wearing one of the badges, and a close-up of what it looks like. Another good work session tonight. Wayne as usual arrived first, and wasn’t feeling up to working on the Roundhouse so I gave him some model work to do. He filled some bubble holes in the resin gondolas I’ve been working on with putty, and sanded the sides of the AHM boxcars to remove the lettering prior to priming. He seemed pretty satisfied doing that and it’s a big help, gets them closer to being finished before the next Op session. Tom arrived shortly after, and he set to work filling the last open section of benchwork between Catherine St. and Wall St. in South Norwalk. He made a template from cardboard to match the shape of the opening, and then cut a chunk of 1” foam to fit. He had to shim the grids below to get it to sit at the right height, and got it glued in place before the end of the evening. One more small hole to fill with cardboard or foam and we can start putting on the plaster! I was surprised when Jay showed up – he’s been working long days for months and hasn’t been down in some time, but it was great to see him. 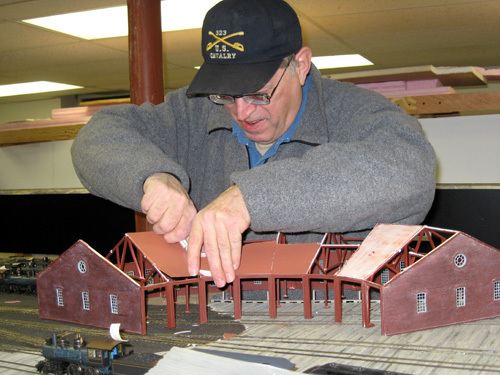 I gave him the icing platforms from the Walthers Ice House kit to start kitbashing into loading racks for Standard Oil. Jay had done a lot of work on this last year trying to build it out of wood, but that project went by the wayside when he got busy. Now he should be able to kitbash it pretty quickly using the parts from that kit. He got a good start on it tonight, hopefully he will be able to come down again soon and get some more of it done. He seemed excited about doing it, so we’ll see. Ted P made it down, and I had saved the assembly of the Mantua New York & New England cars for him. He got right to work with the Dremel (had to remove some ribs on the inside that interfered with the weights), a file and a pair of pliers, and soon all the car shells were re-united with their underframes. I still have another six to decal up, and this time I think I’ll snip off the little door stop on the side to get the decals to sit flatter. I’m not sure what I’m going to do about the first six, which didn’t come out too well. He was really happy with how it all came out, I think he really liked being on that project from the beginning to the end (though Wayne had a lot to do with it too). Finally David came down and he and I worked together on trying to finish up the switch machines and linkages under Dock Yard. We got two of the more difficult linkages installed, and also got the last two really difficult switch machines in the back of the yard installed. I can finish those up later in the week by myself, which leaves only two more switch machines to go. I have a little bit of scenery work to fix as Dave accidentally blew on the turnouts and discovered the ballast wasn’t glued down, but that’s OK. Frankly I’d forgotten it wasn’t glued down myself! 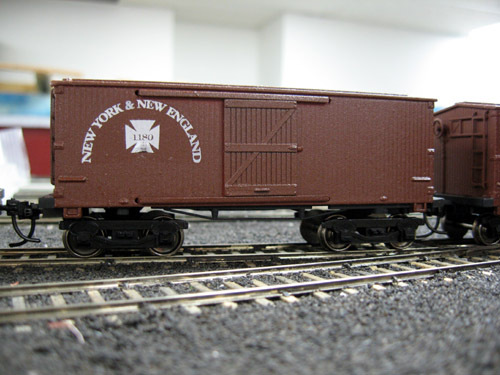 I took six of the Mantua boxcars slated to become New York & New England cars and started decaling them up. The decals turned out great, but I had a big problem with the large blocky door stop molded into the side of the car. It ended up right underneath the maltese cross decal and deformed it. I should have stopped after the first decal, but I tried a few things like slitting the decal to go around the block – nothing really worked. 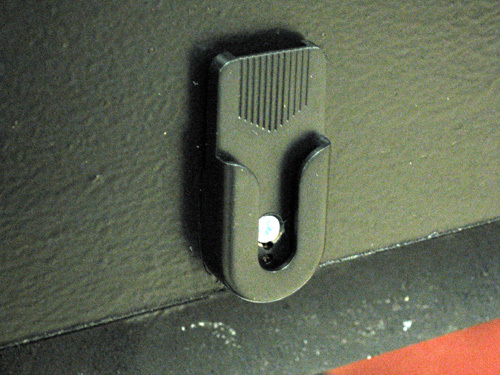 Now I have to figure out how I’m going to clip off that door stop and redo that part of the decal to fix the problem. Other than that, the cars look great! Well it has been a busy week! I was going to work on designing some decals for the New York & New England cars tonight but Ray called and wanted to come over. Three times in a week? "Great!" I said, and prepared to get some more work done downstairs. When Ray got here we went after the short circuit in Dock Yard, and found not just one but three. A new turnout in the yard had track feeders soldered to the frog (gap cut in the wrong place), an electrical frog polarity switch wired backwards, and a frog gap bridged by a blob of solder. All are now fixed, and the yard and mainline are back up and running. After he finished up with that, he decided to pick up on the scenery around Catherine St where Tom left off a few weeks ago. He started laying in cardboard strips, and quickly switched to styrofoam when hoe go to the straight areas. He worked on it for several hours, and got nearly the entire length of the peninsula done. It's now ready to be coated with plaster (structolite) and scenery can be started. Now of course he's like "Get with it!" on the backdrop painting so he can proceed. While Ray was doing all of that, I worked on getting the New York & New England cars closer to readiness. I re-applied the weights on the cars using bits of double-stick tape (Ted Pamperin's idea), then I started working on the eight AHM boxcars Dave picked up for me a few months back. I stripped all the crappy trainset features off the shells and clipped the couplers off the trucks, and then replaced the wheelsets in the trucks with Intermountain code 88 wheels. The shells will start getting more work next week. I also repaired one of the fusees installed around Dock Yard, it had gotten disconnected at some point by having the wires snagged. With a little guidance from Ray, I was able to reconnect the switch and the LED, and amazingly enough it works again! And I made a new special turnout machine linkage for one of the four difficult to get to switches left to go. We worked until one in the morning and I can't thank Ray enough for all his help this week. This weekend I'll finally get around to working on the decals, and I really need to vacuum the basement out well. At this point I expect to be calling for a new op session in late August or early September. A very productive session tonight. Wayne arrived first and now that we had fresh epoxy he was able to finish the bracing on the roundhouse. Next session he will be able to start on the roof, I hope. 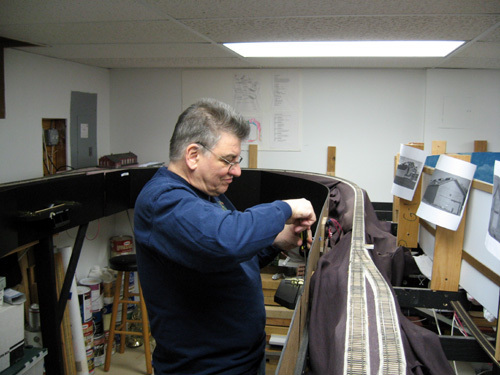 After that, he got to work on preparing the underframes for the 12 Mantua cars I started working on over last weekend. He got the coupler pockets and couplers mounted on all the underframes, and then installed all the trucks. As soon as I get done decaling these cars they will be reassembled and ready to go on the layout. Thanks Wayne! Ray arrived next, and he and I decided to tackle the turnout linkages under Dock Yard. It was a little slow at first, as I had to make up some parts and also needed to advise others and find tools, but after a while we hit a good stride. By the end of the evening (about 11:30) he and I had hooked up all the turnouts under the yard except for the five that still don't have switch machines installed yet. 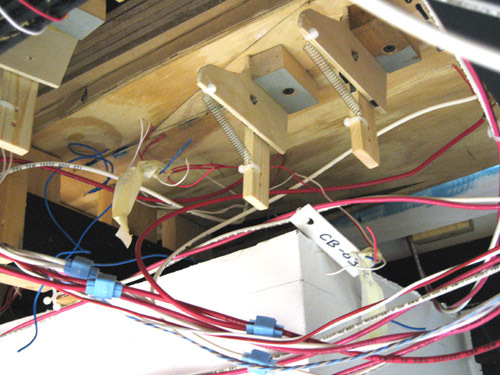 We also fixed two or three turnouts whose popints had broken off the switch rods, and adjusted all the electrical switches that throw the frog polarity on each machine. I really appreciated him sticking around to help finish the project. At this point I'm confident we will be able to make a early August deadline to have another operating session! But that wasn't all, I was fortunate to have Ralph and Mike down too. They did me a big favor by finishing up the cabling for all the fast clock / train order board panels. They cut new holes through the drywall around the utility closet to route the cables through, and then did some wire management under the layout to pick the cables up off the floor and tuck them neatly under the layout where they can't be seen. Ralph also got another passenger car set up with swiveling coupler pockets before he had to leave, which will help a lot. Happened to talk to Ray tonight who was looking for something to do, so he came over. 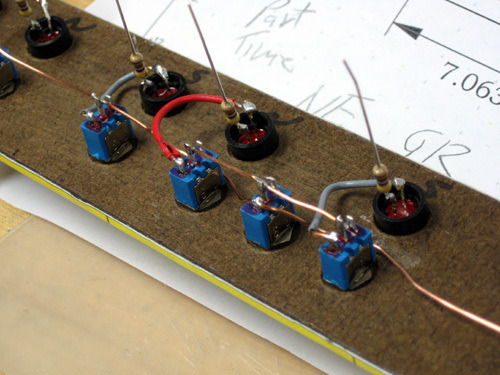 He spent some more time working with the telephone circuit, adding some parts that should have boosted the volume but it didn't work out right. He seems to think the circuit wasn't built correctly in the first place and is considering trying to put together a replacement for it. Ray and I are also looking at some information provided by Seth Neumann of the Layout Design SIG that may help us figure out a complete system approach to meet the needs I have. While Ray was working on the circuit, I hunted around for and found some other unfinished resin car models, some of the 28' gondolas I made years ago. 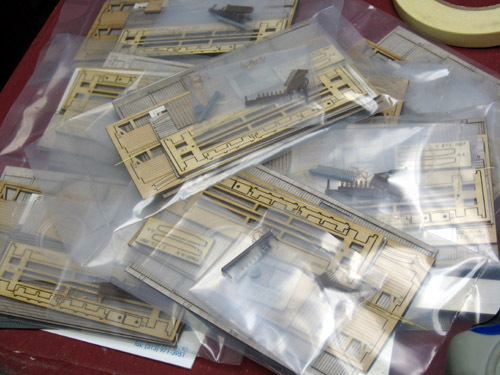 I sat with him and cut, scraped and filed these models to get them ready for building. 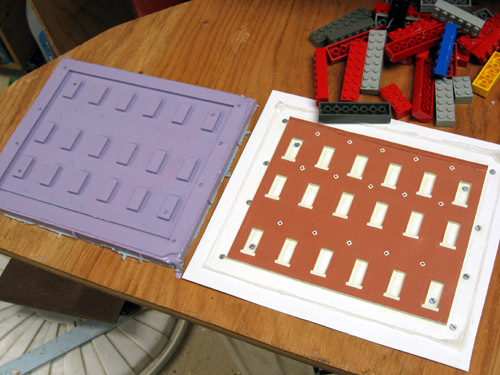 Many of these will need a bit of filling with putty to close up some bubble holes, but it should add another five or six gondolas to the layout when I'm done with them. It's been nice this weekend to get some work done on the railroad. I haven't been able to get back to the RDA Mill kitbash yet, but I was able to get some more cars closer to being put on the railroad. Saturday I took some time and disassembled all of the recently acquired Mantua boxcars I bought on Ebay, and cleaned of the dirty shells with soap and water. I examined the lettering printed on the cars and saw is was very thin, so I took one outside and sprayed it with primer to see if the lettering would telegraph through. It didn't, so on Sunday I took all the shells outside and sprayed them with primer, and after deciding the primer color looked good enough to keep ( a red/brown earthy color) I sprayed them again with acrylic gloss. They are ready now for decals. If only I had the decals ready! Also on Saturday I dug out a bunch of gondola cars that Ray had cast for me over a year ago. These were from a mold he made of a built-up and kitbashed Tichy car, the idea was to save labor by skipping all the assembly steps and start with an almost finished shell. I took some time and cleaned the flash off the castings, and found except for a couple of minor flaws here and there almost all were in good condition. So they got washed and painted too. 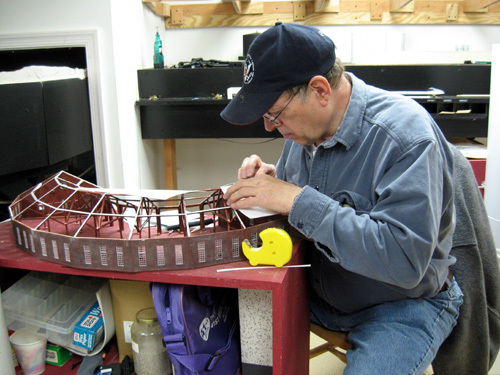 They will require more work that the Mantua cars (weights, needle beams, truss rods) but should build up pretty quickly, and add much needed gondola capacity to the layout. Finally, before hitting the sack on Sunday I took all 24 of the trucks from the Mantua cars and replaced the plastic wheelsets with metal ones. I was surprised to find they actually roll pretty well right out of the box (so to speak) with just good wheelsets (Intermountain) installed. I think when these cars are finished they will make good additions to the fleet, better than I had expected. In my quest to complete started projects before beginning new ones, I spent some time today working on the train order signal panels around the layout. Last week Dave explained to me how to make up cat-5 network cables, and with that and data I got on the internet I set out to see if I could manage it, even though I'm color blind. Turned out it wasn't so bad, I was able to see enough difference in the colors that I was able to do a good job. So I ran a bunch of network cables all around the layout to the recently installed train order signal panels and crimped on the connectors - and not one mistake (verified with a cable tester). So naturally now I wanted to see the panels working! I go to work on making the final connections from the operators panel to a series of cat-5 sockets that will get mounted on the back of the panel. This took a few hours to complete, and as you can see in the photo below the wiring is a bit of a mess, but in time I had made all the connections. I wired it up to a power supply and -- nothing. I tried a few different panels and still nothing. 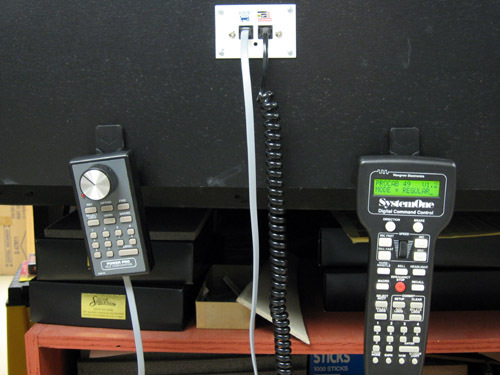 Then I remembered I had to plug the cables into the local panels as well as the main operators' panel. Once I did that, it worked like a charm. Here's a photo of the panel at Dock Yard displaying a stop signal to southbound traffic, and an all clear (no orders) to northbound trains. Happy Independence Day! A good day for me since I was able to spend most of it working on some projects, thanks to a rare day off from work. It enabled me to get some projects off the ground I've been thinking about for some time, and a chance to make up a little ground on some I haven't touched in a while. 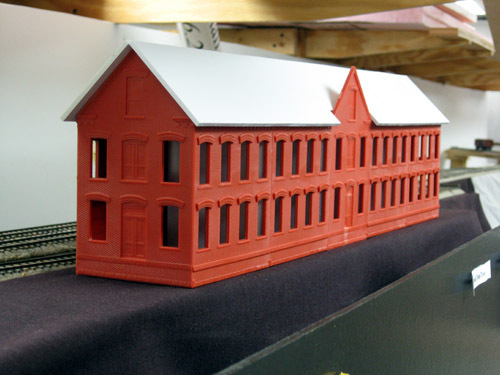 I've really wanted to do some modeling lately, and I've had a jones to work on some of the mill buildings I've been planning for the Winnipauk area. One is a large mill based on the castings we made for the Norwalk Iron works, but I still don't have everything together for that yet. The other is a kitbash of the Railway Design Associates Easton Mill kit, which I've owned three of for some time with an eye on making this model. I was going to use all three mill kits to make one really long building, but I was surprised to find that one of them, the earliest one (a boxed kit), had a completely different yet similar set of parts, which were not totally compatible with the later bagged kits. I decided to use the two bagged kits to make one building and use the other as a separate building, but part of the same mill complex. Combining the two kits meant I could use four side wall sections on each side, plus one of the end walls to make a structure about 28" long and only 3-3/4" wide, with a central transverse gable in the center. 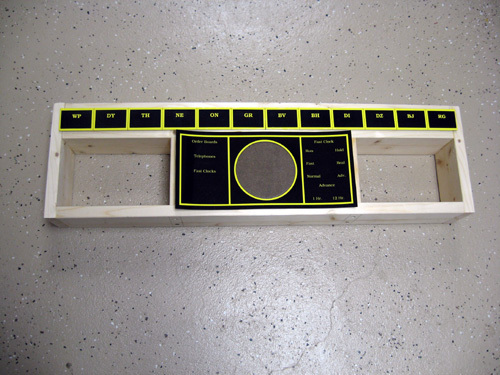 I laid it out on my workbench and really like it, so I got started building it. The RDA kits are a lot like early DPM kits, they require a little extra work to make them really pop. I brought all the walls that joined at right angles upstairs to the wood shop and cut the mating edges to 45* on my tablesaw. This allowed me to join the walls without losing any brick detail. I then made intermediate braces to support the building and the roof panels, all of wich I made from 1/8" thick styrene (also cut on the tablesaw). I was happy to get this far, and when I get my disc sander back from Dave I'll finish working on the central gables. I also did some work on the Fast Clock / Train Order panels today. I finished up installing all the hinges on them, and then went around mounting them to the layout near all the passing sidings. There's still a long way to go with these to finish wiring them up, but it felt good to get them off the workbench and clear it up for another project. I'll finish up all the artwork on them later this week. I've also purchased a cat-5e network cable crimper for myself, and hope to start running out the signal lines to all the locations very soon. I took advantage of a sale at Amazon.com a couple of weeks ago, they were selling 14w compact fluorescent bulbs in bulk packs for about a buck and a half apiece. At that price I could not say no, as I've been planning on using these for lower level lighting for over a year now. They came in last week, and Monday I stopped at Home Depot to buy sockets to mount them with. Bloody sockets cost twice what the bulbs did! Anyway, I decided to set up a test over Winnipauk to see how these bulbs would work out. I mounted a socket underneath the upper level benchwork and wired it up, and plugged it in. I also taped up some cardboard to see how deep a valance I would need to keep the glare out of my eyes. It's only one bulb so far, but it burns pretty cool compared to an incandescent and throws a decent amount of light on the scene. I won't need to be worried about starting a fire or having someone get burned, or melting a model with tens of hours of work in it. The cool white color matches the rest of the room lighting, and I'm sure it will look even better when I get five or six up more bulbs up there to really fill in the shaded areas. Below you can see a quick and simple test I did with the light on and off. 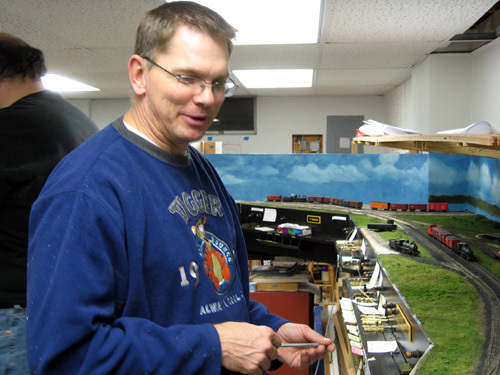 And finally, a few days ago the custom boxcar kits I talked to Bill Wade of B.T.S. 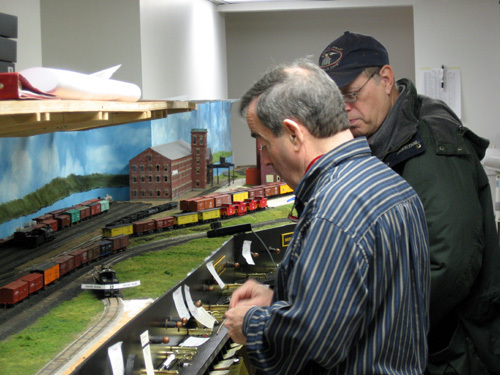 Models about at last year's NMRA National Train Show came in. They are based on a slightly larger B&O car, but Bill made a few special changes for me, including different ends and shortening the car a bit to meet my needs. I haven't built any of them yet but I'm really looking forward to it. They seem as well engineered as B.T.S.' original Civil ware era radial rood boxcars, and should go together really easily. They will really help me flesh out the Housatonic's car roster! I had a good crowd tonight, which really made me happy. Much work was done, and we are rapidly getting close to where we can operate the layout again. 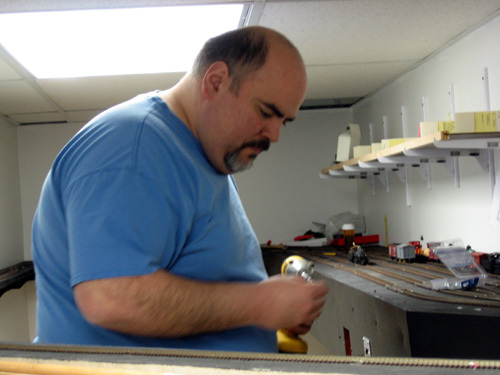 Ted Pamperin arrived first, and he helped out by starting to attach Kadee coupler boxes and couplers to some of the newly acquired rolling stock that has been building up (some of them from his own collection!). He had a couple of false starts but eventually found a good way to attach the boxes to the cars. He got five done, and we figured out how to streamline the next couple of dozen for the next time we get together. I’m excited to be getting more rolling stock on the layout again! Tom was down too, and continued to work on getting the basic scenery forms in the area around Catherine St. This is starting to come together, very soon I will need to work with him and set the proper angles and clearances to get the proper look and feel I want. Dave picked up where he left off last week, and continued wiring up the switch machines under Dock Yard. Neil was down also and worked closely with him, Installing microswitches on the nearly finished switch machines, and putting in some overlooked details like a turnout throw rod here and a few feeders there. Between them the got all but 5 or 6 turnouts under the yard installed and wired up. Now I need to get under there and complete the linkages to connect up the barrel bolt controls. We found at the end of the night that a short has crept into the yard somewhere, that will have to be found and fixed before we move on to the last of the switch machines. Ted and I continued our work on the backdrops around Wilton. We took one of the 1/8” thick styrene panels we bought last month and cut it up on the tablesaw into 10” wide panels, then joined it with a few .020” splice plates across the back. 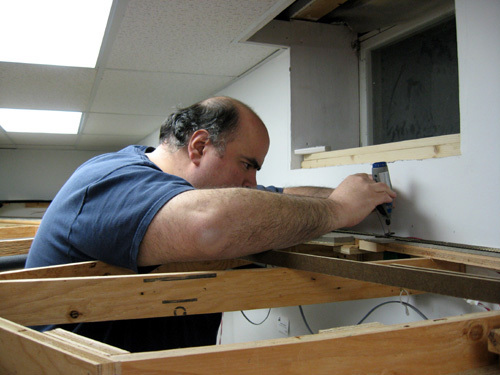 Then Ted carefully located the upper-level brackets and cut notches out in the top of the 12’ long backdrop, and finally we hung the backdrop by smearing some adhesive caulk on the mounting plates and brackets, and attached it with staples from my pneumatic stapler. So it will be a few weeks until the next work session as we round-robin around to some of the other layouts in our group, and that will give me time to get some of these tasks done and maybe do a little modeling too. Ray Louis called me up tonight to see if there was anything going on, so I invited him over to see if we couldn't get the phone system I inherited from George Berisso's SP&S layout working. Fortunately Ray is a real electronic whiz, and it took him an hour or two to puzzle it all out. In the end, he managed to get the thing wired up enough to prove that it still works! We will have to see if we can get the volume a bit louder, but I'm very encouraged that it works. 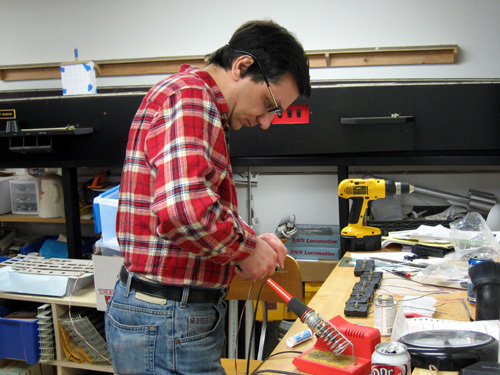 While Ray was working on the phones, I took the opportunity to get some work done on the last batch of switch machines. I had picked up extra springs and tubes of epoxy at the home store earlier in the week, and knew I needed to finish up more machines for the next session in a few days. So all the unfinished machines got springs installed whild Ray was doing his work. A good night, one where I would have just vegged out watching TV if he hadn't called. Thanks, Ray! Tonight we eased back into working on the Housatonic. Unfortunately I was missing some key components for a few projects, so we were not able to hit every project I wanted to get to, but we did all right. 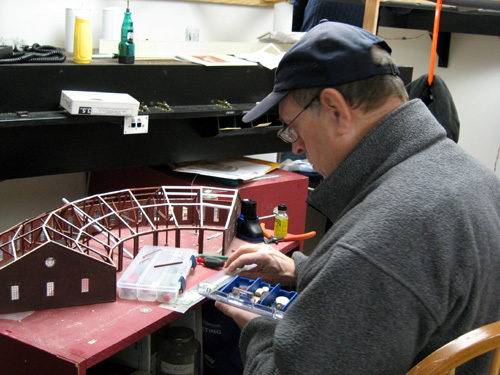 Wayne was first to arrive, and was ready to work on the Roundhouse model. I had acquired new brass channel to reinforce the rear walls, but somehow ran out of epoxy since the last session. I was sure I had more but could not find it anywhere. So that went by the wayside until next week. When Tom arrived, I asked him and Wayne to start working on putting in some scenery forms along the long peninsula across from Wilson Point on the way to Winnipauk. We may end up calling this area the Catherine St. crossing, but I’m not sure that’s correct yet. I gave them a drawing of what it is supposed to look like, and a few cross-section drawings to show what the contours of the land should be doing at various points. 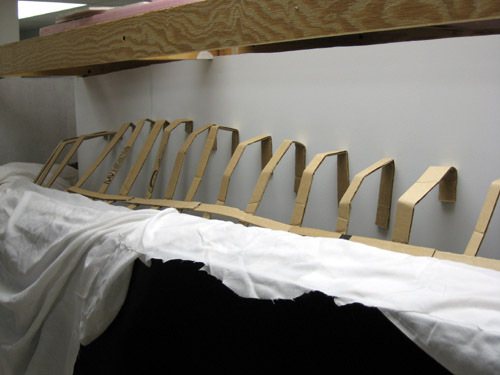 They used a combination of foam chunks and cardboard strips to start laying in the forms. 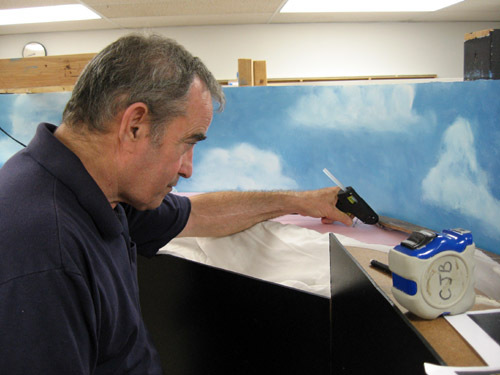 Ted came down, and he and I worked together on installing backdrop supports along the walls around Wilton. We put up several 1-bys after determining the height of the upper level through here with a water level, and also installed a number of metal brackets that will support the upper level benchwork when it finally goes in. Now that these are in place, we can go ahead and continue putting in styrene backdrops from Winnipauk all the way through Wilton. Hopefully we’ll start that next week. Dave came in a bit late, and I asked him to start wiring up all the switch machines under Dock Yard he put in last time. He did a good job, wiring up all but two machines before he burned his finger by dribbling solder onto it. We’re definitely making progress through here, maybe we’ll be ready to have another session an a couple of months. I’d really like to do that before the end of summer. Well, some good news to report this week. I just completed a deal with Bill Wade of B.T.S. 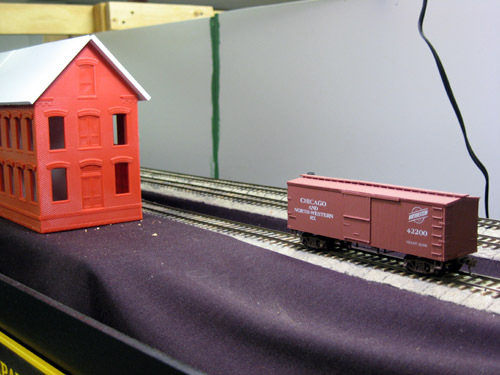 Models for a custom run of laser-cut period 32’ boxcars with radial roofs. Bill and I met at last year’s NMRA National Convention during the train show. At the show I bought a bunch of his 1860’s US Military RR boxcars to use as early Housatonic RR cars, which are running around on the layout now. While I was there we talked about the possibility of a special run of enlarged boxcars that would be more appropriate to the 1870’s – 80’s, and Bill said he’d think about it. Bill eventually decided not to go that way, picking instead an 1870’s prototype B&O radial-roof car to model. He offered to make me some custom cars with differing details based on that model, to which I readily agreed. The Housatonic car should look just different enough from the B&O car to appear unique. I’ll have a number of these new kits arriving in a couple of months, and hopefully I’ll find time to get them built and up on the layout. I’m also looking forward in the coming months to another prototype model for the Housatonic from Alkem Scale Models. Some time ago, a friend named Pieter Roos found a picture of South Norwalk in the late 1870’s, I think, showing two original Housatonic RR boxcars. Unfortunately I can’t show the picture as I agreed not to for copyright purposes, but the cars are radial-roofed with ‘porches’ on either end, and have overhanging roofs to match. There is a photo of a similar car in New Haven paint in the book New Haven Power by Stauffer. I sent a copy of the photo to Bernie Kempinski of Alkem, and he liked it a lot. 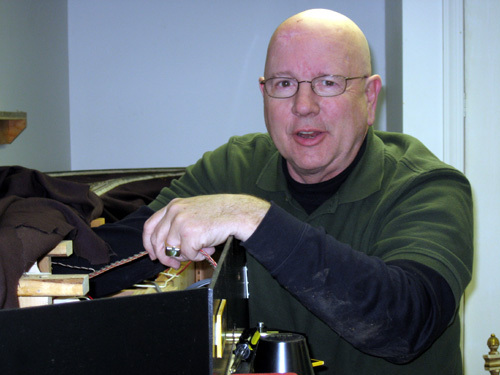 Like Bill Wade, Bernie has a real interest in civil-war railroading, and has indicated to me he will try to bring it out as a kit before the end of the year. I hope that works out, and I’ll be able to but a few of these older but spot-on prototype cars on the layout. 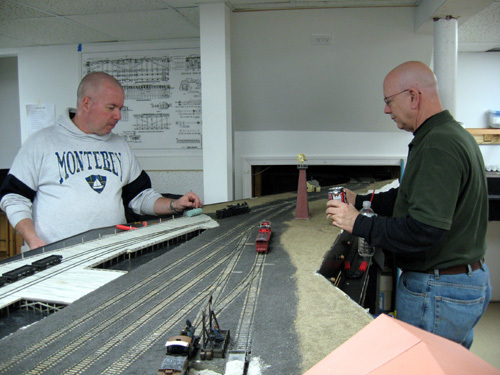 We also spent some time last week at my friend Dave Ramos’ layout (the New York Harbor RR) and did a bunch of casting projects while there. 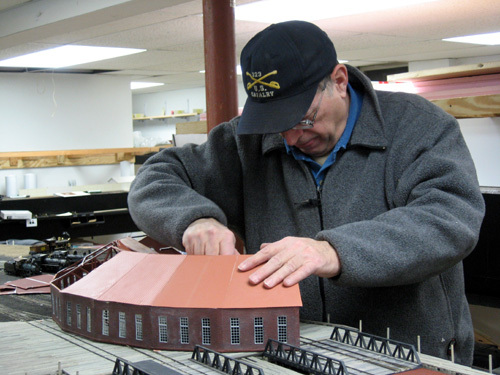 The week before Ray Louis had showed up with a couple of GALLONS of casting resin, and they completed all the walls for David’s 28th St. Erie freight warehouse model. 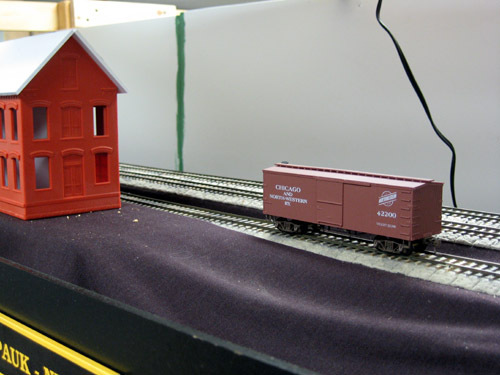 This week Ray and I managed to cast another three NYC&HRRR boxcar kits, a couple of Housatonic 28’ gondola kits, a few 34’ one-piece gondolas and some more doors for the South Norwalk freight house. I must find the time to start building up some more of these resin kits! No update this week. We lost our German Shepherd Dog, Montana, today after almost 14 wonderful years. It has been a very difficult time for us and while I'm sure I will feel like working on the railroad again very soon, this week it's just not on my mind at all. After a two month hiatus, we had a work session on the Housatonic tonight. The bed project still isn’t finished but it’s coming along, and I have been itching to get back to the layout for a month already so it was a good night for me. Unfortunately I forgot to bring the camera down to the basement so there are no ‘action’ shots from the session, but I’ll add a few documentation shots after the fact. Wayne arrived first, right on time, and he and I decided to do a little work on the Wilson Point roundhouse we have been meaning to get to for months. The back wall castings have warped a little over time, and we agreed to reinforce them with some square brass tubing across the tops to straighten them out. We pulled out my Harbor Freight mini cutoff saw and used it for the first time to cut the brass tubing to length. After a little adjustment, we found it worked pretty well. I can recommend it now as a nice, fairly inexpensive little tool for cutting all kinds of small items like brass, stripwood and plastic. 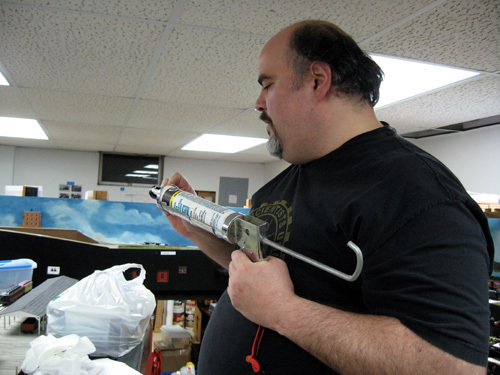 As Wayne started to mix the epoxy to attach the brass tubes to the inside tops of the walls, Ted Pamperin arrived. 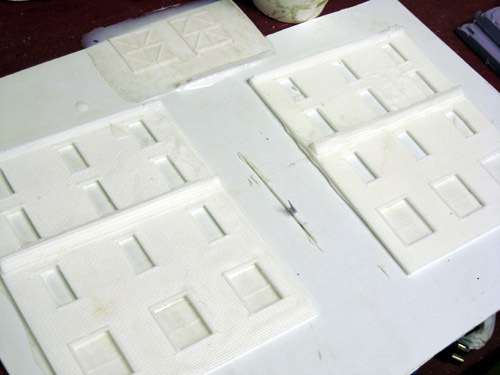 We went through my list of jobs and Ted indicated he would like to learn about casting, so we set up a few molds to pour and got out the casting products. Jeff Ward arrived next and was also interested in learning about casting, so a large part of tonight’s session became a mini-clinic on casting techniques. We poured a set of doors for the South Norwalk freight house, and a couple of walls for a building that will go on Dave Ramos’ New York Harbor layout. I showed Ted and Jeff how the casting resins get mixed and poured, and then we also set up to pour a final layer of rubber on a partially filled mold I had started months ago (a replacement for the South Norwalk iron works side wall, which was destroyed because of bad resin) to even it out and give it a flat base to work on. Not long after I started the mini casting clinic, Dave arrived and I asked him to work on getting the new switch machines installed under Dock Yard. 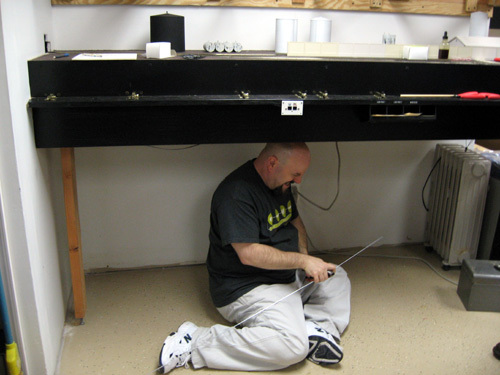 Dave agreed and wedged himself under the benchwork, and Wayne worked with him on spotting and guiding the throwing pins into the switch rods. They got most of the ‘easier’ machines mounted, which is great for me because now all I need to do is get them wired up, tuned and install the linkages. There are also going to be a half-dozen or so difficult to install or special design machines that I will have to make to fit, but I’m looking forward to those challenges in the next couple of weeks. Before Dave left, he did a little work on a few of the new cars I picked up recently (including another handful of cars donated by Ted Pamperin – Thanks) and got new wheelsets and Kadee couplers installed on them. Every little bit helps! I’m really looking forward to working on some of those new cars, getting them rebuilt and tuned up for the layout. I need to get more metal wheelsets – Dave used up the last of my stash! Time to order another gross or two, and that should cover all the new cars once they are rebuilt and repainted. Well, in the last week or so I’ve been spending like a sailor and added nearly 30 cars to the layout roster. Four more Roundhouse 36’ boxcars and reefers from a train store, 8 old AHM ‘old time’ boxcars Dave picked up for me at a train show, and 20 or so more cars, mostly boxcars, picked up on Ebay from a fellow selling off his collection. Now, only the Roundhouse cars are ready to go right onto the layout, all the others will need some work (detail upgrades, paint, trucks / wheelsets / couplers) but I should be able to get a lot of that done quickly. 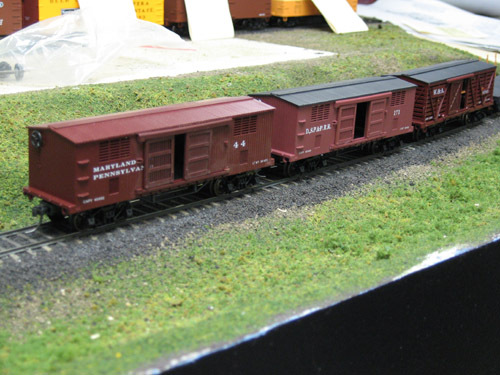 I’m actually pleased with the old AHM boxcars. They look pretty clunky at first glance, but once you strip off some of the heavy ‘trainset’ details like oversize door guides and truck-mounted couplers, they are a decent-looking little car. Even the trucks are pretty nice once you put metal wheelsets in them. I will be prepping and upgrading these cars in the next few weeks and I believe they will be painted up in New York & New England colors, to get some more local representation on the layout. I will probably try to paint up some of the Ebay cars (when they show up) as New York Central or New Haven cars. Well, it occurred to me the other day that I haven’t updated the construction journal in several weeks – sorry about that! The reason is because I’ve taken some time off working on the railroad to catch up on some household projects while the weather is still cool. My wife has been patiently waiting for me to build some furniture for five years now, and it is time to start rewarding that patience. Consequently, not a lot has been happening through April and it will probably be sometime in May when I get started up again. We did have a work session on the 11th of April. During that session, a few of the guys were over and we got some things going. David dropped feeder wired from the new stub-end tracks in staging (to be used for locomotive storage) and attached them to the staging sub-bus. 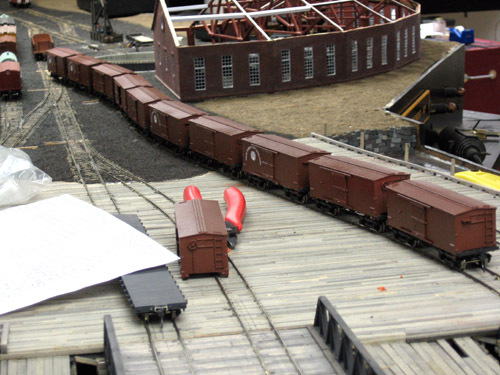 Tom helped out by taking many of the cars that had bogged down in Dock Yard – plus many of the newly added boxcars and reefers – and restaged much of the industries on the layout. And Neil and Jay helped me out working on installing the new switch machines around Dock Yard. This turned out to be even more difficult than I had imagined. There are about six turnouts – the “Sickening Six” -- located over a solid shelf around 6” from the bottom of the sub-roadbed. 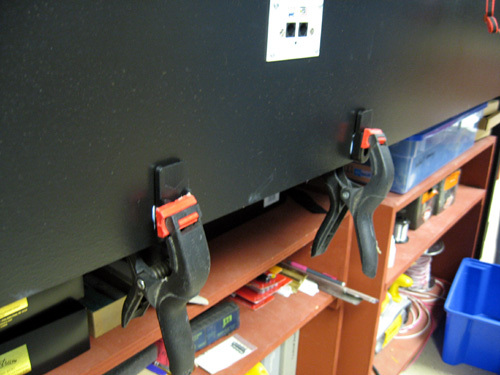 It was impossible to get a screwdriver (let alone a power drill) in there to attach the new machines. We tried several things including screwing the machines in from a steep angle but nothing was working. Getting desperate, I think it was Neil who said, “Lets’ try driving the screws from above.” Having tried everything else I said what the hell, give it a try. Neil drilled a hole between the rails of the turnout about 3/4" from the throwbar and drove a 2” screw down through the roadbed, where I was holding a machine in place from below. To my relief it actually worked, but we busted the mounting blocks on several machines because it was not possible to pre-drill them accurately. We also damaged several ties under the turnout, but those can be replaced pretty easily. After three tries we managed to get a machine mounted and tightly screwed on. Before the night was over we had busted at least five machines and installed three, which was better than I had expected. Once the last three of the Sickening Six are done most of the rest of the machines will be child’s play to install. I have much work to do getting the pushrods and barrel bolts installed but once I get back on track I think that will only take a few weeks. Once again, not too much to report on the layout this week. I decided to take a couple of weeks here in the spring and catch up on some woodworking projects I promised to do for my wife 4-5 years ago. Well, she's been way more patient with the model railroad than I had a right to expect, and with attendance down in the last few sessions I decided to spend some time rewarding her for allowing me to spend so much time working on the railroad. I've been taking the huge pile of lumber that used to be under Dock Yard (which I had to remove to get under there anyway) and cutting / jointing / planing it down into useable lumber to build a king-size sleigh bed out of. I'll post some pictures of it on my companion woodworking site as it comes together. I'm having a lot of fun doing it and if has been a great distraction from the frustration I've been feeling regarding the layout. I guess it's good to take a break so you can come back to a project like this refreshed and with a clearer mind. I was going to cancel next weeks' work session (in fact I canceled all April work and op sessions to concentrate on woodworking) but tonight some of the guys were asking me to have it, so maybe I'll relent and do it anyway. Hopefully there will be more folks showing up next week for the session. Well, not too much to report this week. I've spent a lot of time in the last few days working on getting the hardest to reach switch machines out from underneath Dock Yard. A few at the far left were very difficult to remove because of the tight grid benchwork there, in fact I cut my finger up pretty bad trying to chisel one out that would not come loose (sharp hanging cut-off pushrod wire to blame). Anyway, all the really difficult machines are out now, and I can start replacing them when my finger heals up a bit. Ow. Well, like it or not I'm now committed. Ralph was over today and we clipped off all the push/pull turnout controls for Dock Yard, so now they MUST be replaced with new Mark II switch machines and barrel bolt controls before we can have another operating session. Many of the turnouts won't be so hard to do, but about 3 or 4 will be really, really difficult. Very low clearances. I got two machines replaced today and I hope to do a couple more tonight before I go to sleep. That will leave about 16-19 more to go... Nothing like a deadline to get you motivated to do some work. Ralph was great, helping to install the electrical power-routing switches on the new turnout machines as I was under the layout putting them in. I'm also a little annoyed with myself because I didn't realize my new turnout control trick wasn't going to work here in Dock Yard. It will have to wait until we do some other areas out on the line or possibly some of the turnouts in Wilson Point, which will have to get changed too at some point. The machines under Dock Yard will have to be set up the way the last set were. I know I'm being cryptic, but I don't want to spill the beans until I know the idea is going to work, and now it looks like that will take a little longer. Yesterday I had a work session, and a few of the guys showed up to help. Wayne was down first, and brought down a number of cars I had given him recently to work on. 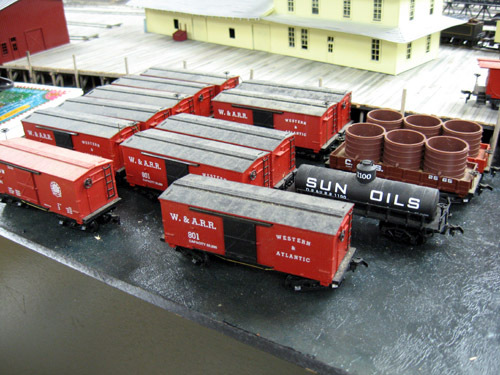 Two new boxcars to add to the fleet, and a half-dozen new flatcars kitbashed form the wooden water tanks cars I bought last year. These flats will soon be kitbashed further into New York & New England gondolas for the coal trade on the Housatonic. Every little bit helps. Thanks, Wayne. 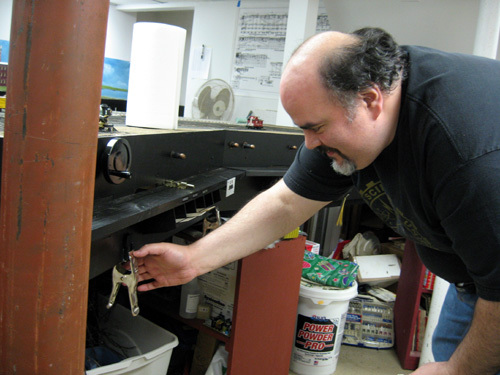 Ted arrived a little later, and he and Wayne got to work on assembling the fast clock panels. I had them glue in a pair of blocks to hold the inside clock panels tight to the plexiglas fronts, and a third that gets screwed in so the board is removable for maintenance. They tried to install the hinges that will hold the clock boxes to the fascia, but couldn't get them on straight. I'll fix this later with a drilling jig soon. Dave arrived a while later and I asked him to finish up installing the new throttle hangers around the fascia. The caulk we used the last time wasn't strong enough by itself to hold on the clips, so Dave went around and firmly attached them with 3/4" screws. Now they are very sturdy. Ted later helped Dave by getting a bunch of new clips ready for him (removing the belt hooks) and Dave screwed them to the layout, finishing up that project nicely. Mike Sicurella was down again, it was great to have him back. Mike did a little here and there helping out, including re-installing some barrel bolts in Wilton after they had been removed for shelf painting a few weeks ago. We're hoping to be seeing more of him soon. Finally, tonight (Thursday) I got to continue the wiring on the Operators control panel, installing and soldering almost 50 new wires in place and getting all the LED / switch connections hooked up. Soon these wires will get attached to a power source and ethernet cable jacks, and I'll be able to start hooking up the fast clock panels around the room. There's a lot of work yet to be done on tis project but I'm pleased as to how it has been progressing so far. I was really pleased when Jay Held showed up on Sunday to help out. I thought it was going to be another long weekend of working all by myself, but instead we worked together and got all of the 30 new switch machines assembled and built-up for the Dock Yard push. I was really grateful for the help, it makes the time so much more enjoyable to have someone to talk to and laugh with as you get things done. Thanks again, Jay. We’ll be able to start getting the new machines installed at Wednesday’s work session. 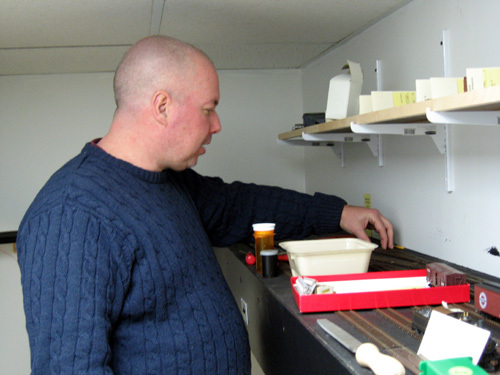 During the recent LDSIG tour we hosted, one of the guests who came down to see the layout had some interesting ideas on how to make some improvements. 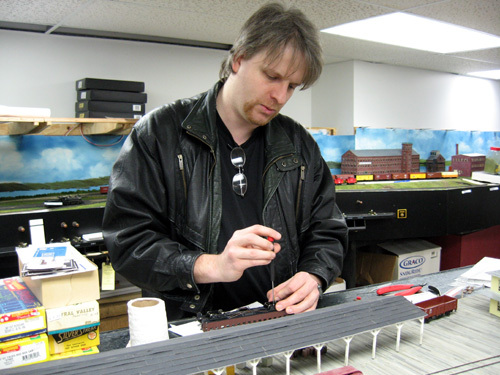 Arthur Ross is a model railroader and mechanical engineer who took an interest in my turnout control mechanisms, and we have been talking about some possible improvements that could be made to help them work even better, or at least not so time-consuming to make. One idea he suggested will be tried out soon, and if it works it should stop the pushrod binding problems I’ve had on some of the installations. I’m really looking forward to the suggestions he has to make. I’ll report on it if it works out well! Last couple of evenings I’ve been continuing to work on the operators control panel, I began the wiring last night and spent most of the night with my head racing, working on how I’m going to hook up a fast clock, the fast clock driver, power supply, and all those train-order LEDs and switches inside a relatively narrow enclosure and still make it possible to set the clock from time to time. I may not have gotten much sleep but I think I figured it all out by 4 in the morning. I continue to plug away at the many projects going on the railroad but I’m in one of those ruts right now where it seems no matter how much work I try to do nothing is happening. I spend tonight doing more work on the operators’ control console, drilling out holes for switches and LEDs, and then installing them. I didn’t feel it should have taken three hours to do all that, but it did. It’s disheartening. It doesn’t look like much, but there’s a lot of work in this panel already and much more to come as I start wiring it up, which I imagine will consume at least another 4-6 hours in the next week or so. That will be 2-3 nights of work all by itself. I’ll be really excited when the time comes to start hooking up the clocks and train order signals, but until then it is just drudgery. I hope to get this operations project with the fast clock / train order panels completed and installed before the end of the month, so I can start moving on to other important projects that must get done too. I had to cancel the March operating session for next Friday because there are still so many things that have to get done, and these days I’m not getting as much help as I did in the last few years. I’m a victim of our success. We built a great crew of guys up, and now some of them are building layouts too. So now we share work sessions between us all and that’s great, but work on the Housatonic has really slowed down as a result. At one point Neil suggested that maybe we should have split sessions with more than one layout open the same night. Maybe it’s time to try that idea out. I’m not sure how well that would work out, but even if I only got one or two people once a week it would really improve the productivity rate on the layout. I will have to float the idea out to my friends sometime in the next few weeks. Just a quick update. Not much going on over the weekend, but I did get some work done. Got all of the 30 new switch machines all machined over the weekend, but not yet assembled. 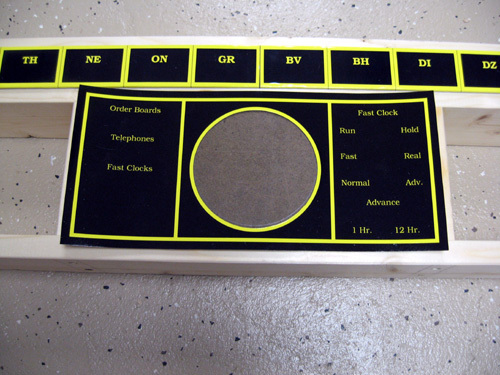 Also got some more work done on the new operators' control panel, getting a good start on the parts and actual panels. And finally I got to do some more work on the clock panels that will get mounted in the aisles -- I think you can get a good feel for how they will look now. I'm pretty happy with them. 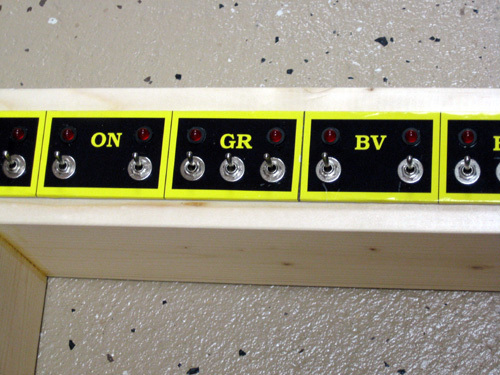 The operators' control panel will have switches and LEDs across the top that will control the train order signals all around the layout, and will have a 4" clock in the big center circle. 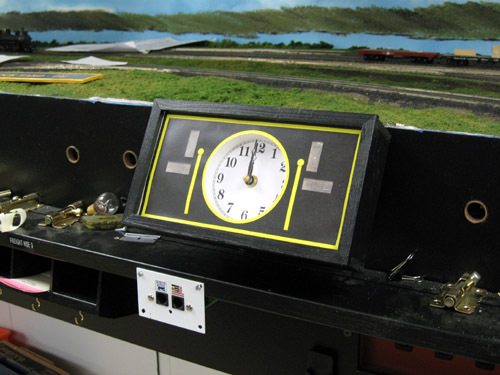 The control panel on the left of the clock will be for the power switches - Fast Clocks, Telephones, Train Order boards. The panel to the right will control the fast clock features. The open spots are going to have small shelves built into them to hold paper forms, like Clearance forms and Form 19's. 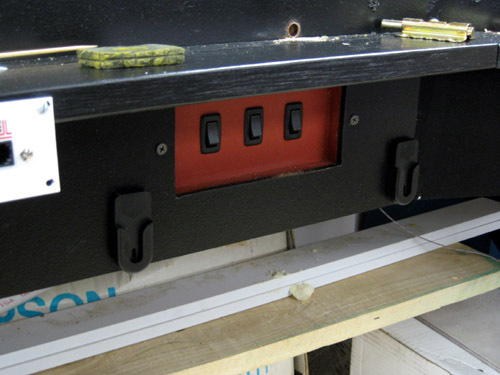 The bare wood will be painted black before the control panels get attached. With a cold snap going on in this part of the country this week I'm not getting much done. I'm pretty much limited to what I can do on my PC, since both the basement and garage are too cold to inhabit for long. 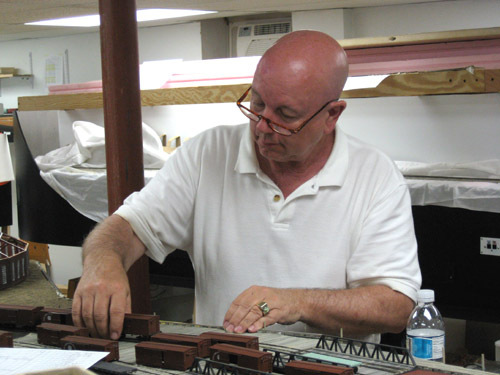 I've been working on a project for one of my friends, Scary Ted, who is modeling the Lehigh & Hudson River RR in N-scale. 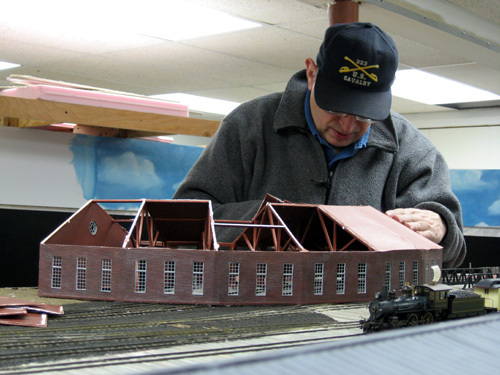 He needs a model of the Sterling Hill Zinc Mine for his layout, and last month I offered to help do the plans and build it for him. So for the last couple of days I've been carefully looking over photos and maps of the structure and peiceing together a CAD drawing of the structure. 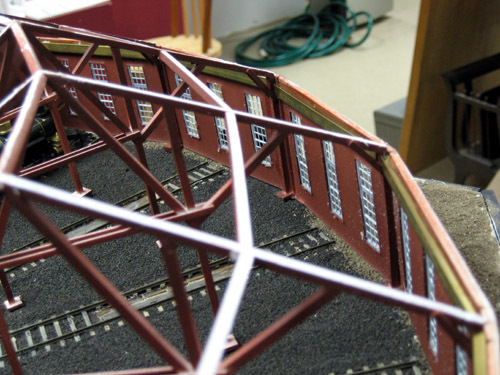 Thank goodness it's N scale, it will still be big at about 14" wide and 20" deep and 14-15" tall, with many details and bump-outs that make the structure interesting. I think this project will be a lot of fun. Before the cold started over the weekend I got some new parts cut out for a batch of new switch machines to be installed under Dock Yard. I'm hoping to brave the cold tonight (18 degrees and lower forecasted) and eke out enough time in front of the table saw and drill press in order to make the rest of the parts so the machines can be assembled. We'll see how long I can go before frostbite forces me inside. If I can get the parts I need cut and drilled I can sit in front of a space heater in the basement and start assembling them for Sunday. Wayne arrived first and got right to work on starting to put together the new roundhouse roof parts. He’s discovering, as Rob had discovered, that it is a pretty complicated project. But he seems to be progressing nicely. I gave him a supply of sheet styrene to work with and he has already cut several sub-roof panels to rebuild the roof itself. He noted there has been some warping in the roundhouse walls; I will fix that this weekend by epoxying on some brass tubing inside to reinforce them. Next was Neil, who we haven’t seen a lot of lately. Neil got to work on Dock Yard, trying to fix the trackwork issues there Tom had identified in the last work session. It looks like he did a pretty good job because things were running a lot smoother over there by the end of the session. He did identify a couple of more serious problems I’m going to have to work on between sessions that could not be easily corrected. He also used the big 12” drill bit I bought to drill through the grid benchwork behind the fascia so we can start replacing the switch machines in Dock Yard soon. I’m hoping to get more switch machines made in the next few days so we can get some of the more critical turnouts in the yard done before the next op session. Dave arrived shortly thereafter, and I asked him to go around and start putting up the new throttle hangers I bought earlier in the week. As he put them up using a smear of adhesive caulk and holding them in place with spring clamps, I was unpacking them and removing the belt clips from the swivel brackets. 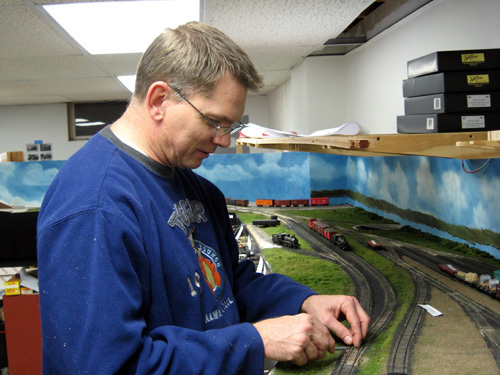 Dave worked quickly but I was able to keep up with him until we ran out of brackets – looks like I’m going to need another 12-15 to finish equipping the layout. I will probably also need to go back and reinforce each bracket with a screw to hold it fast to the fascia. Neil and Dave both recommended we should mount the brackets on the bottom edge of the fascia instead of higher, and avoid putting them on the edge of the control shelves, and I think they were right. Fortunately the kits came with all the slick-on swivel buttons we’ll ever need to attach to the throttles. All in all I’m very happy with them, though we’ll have to wait until the caulk dries to see if they will work as advertised. Ted arrived at the session late (fell asleep on the couch) but was able to help me out by painting the fast clock / train order board panel boxes for me. Not an exciting job to be sure but actually very helpful, as I’ll be able to finish building the panels this weekend and get them mounted to the fascia in the very near future. 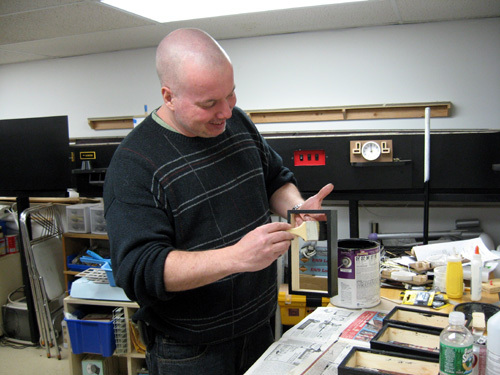 He also helped me change out some of the old Fusee control panel castings for the new bright yellow and black ones that match the rest of the signage. 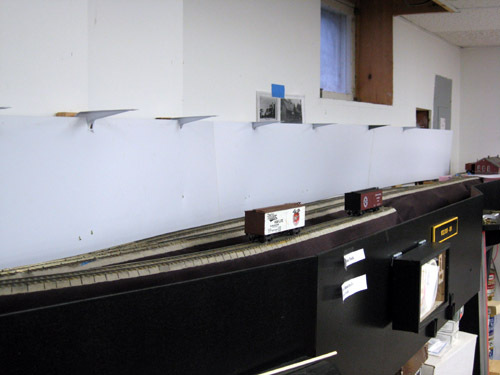 The 2007 Layout Design SIG New Jersey meet is now behind us, and finally I will have time again to start working on the layout. I was really glad to be a part of it and a presenter, everyone seemed to have a good time and many said they learned a lot, which is a measure of success in my book. The resistors I was waiting for to finish building the fast clock / train order board panels finally came in last week, so this weekend I finished wiring them up. I was able to run all the panel wires to a computer networking cable jack, which will really simplify the necessary wiring. I also spent some time in the garage (brrr it’s cold out there) cutting some lumber into boards I could use to build the boxes I’ll mount the panels into. A few hours out there (BRRR!) and I had all the materials I would need. Sunday evening I assembled all the boxes (in the relatively warm basement, ahhh), and hope to get them painted at the work session this Wednesday. 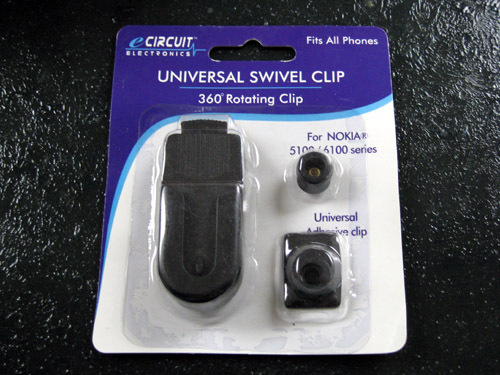 I had a nice surprise yesterday, I happened to walk into a local dollar store and while looking for something else I happened across a mess of swivel belt clips for mobile phones. Immediately I realized this was a bargain price for these devices (which I was going to have to order retail soon anyway) which can be used to hang throttles off the layout fascia. At $1 apiece I bought 25 of them on the spot and will find a way to mount them on the layout so we’ll have someplace to hang throttles when not in use. Well, talked to Ray last night and he repeated the instructions he gave me, said it should have worked. So I went down and tried it again tonight and what do you know, this time it worked perfectly. No idea what I did wrong the first time, but so what. I'm happy it worked out. 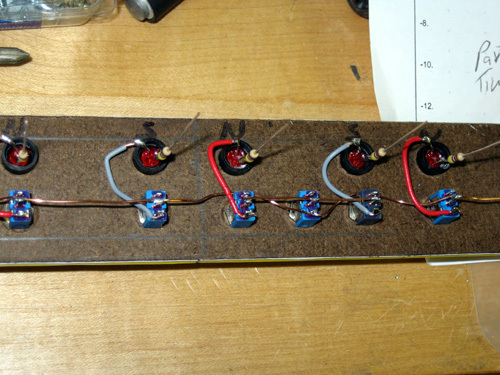 So now I've got the needed resistors on order, and I can start working on getting the panels wired up -- I'll just leave the connections for the resistors open until they arrive. I have some cleaning up to do this week before the LDSIG meet tours this Saturday, and I still need to finish my 15 minute presentation too. Hopefully I'll have enough time to do it all. Finally got warm enough today (barely) to get into the garage and cut the parts I needed for my fast clock / train order panels. I cut a dozen rings out of 3” PVC pipe for the clocks and made about 30 or so light baffles for the train order signals. From there I brought all the parts to my workbench downstairs (where it was a little warmer) and started assembling the back plates for the panels. 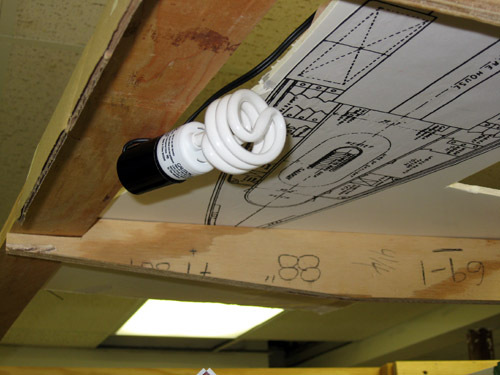 I hot-glued the PVC rings on and yellow-glued the light baffles to the Masonite boards. Felt good to have these starting to come together. When the glue dried I got out the drills and cut the center hole for the clock mechanism (5/16”) and two holes each for the train order flags inside the light baffles. The ¼” bit wasn’t quite wide enough so a little work with the round file got the holes the rest of the way. I inserted one-half of the LED holder into the hole from the front (had to use a pencil-point to seat them), inserted the 5 mm. LEDs from behind and pressed them until they popped in, the attached the second half of the holder from behind. Not as easy as it sounds, but it worked great in the end. I also tried to start figuring out how to power the LEDs but I must be doing something wrong. Ray gave me instructions on how to do it but I could not get them to light up with the dropping resistors he recommended. I hope I’ll be able to figure it all out shortly and finish up the work on these panels. Well, after a month of feeling lousy, I’m finally on the mend, I hope. Tonight’s session was well-attended, and we got several important items on my punch list from the last Op session fixed. Ralph arrived first, a rare Wednesday when he didn’t have to attend rehearsal. He was followed by Wayne, who got to work right away on the roundhouse, fixing some of the framing problems that we found last week after tearing off the roof. Ralph took on the job of finding a way to put swiveling coupler pockets on the passenger cars to allow them to better traverse the sharp curves on the layout. Jay was down, and I piqued his interest by asking him to work on an electrical task, auxiliary power to the DCC system’s command bus. During the last Op session, we had so many throttles plugged in the command station failed to provide enough power to run them all. Jay helped me out by mounting a 12 volt power supply near the staging area, and preparing a set of wires that connect to on one end and a 1/8” phono plug on the other. These lines will plug into one UTP each at the far ends of the two command buses (which both terminate by the staging area) and the power supply, and will provide more than enough power to stop that problem from ever occurring again. Tom did me a big favor by carefully running trains back and forth through Dock Yard, and noting down where the locos and cars were having trouble. He found a number of possible gauge issues around some of the turnouts, as well as some ballasting problems that will have to be corrected. I hope to get a chance to work on that this weekend. Ted helped out by finishing up an unfinished issue in staging; I have wanted to put in some extra stub-ended layover tracks in the back corner but ran out of time a few months back when I was working on the mole yard. Ted grabbed some leftover switches and flextrack and put in a few tracks off the top of the yard ladder where we can now store locos out of the way, where they won’t foul the fiddle tracks in the yard. Eventually we’ll rework this and put in a simple, manual turntable to ease the turning of locos , but that probably won’t happen for a while yet. I spent most of the evening floating between all of tonight’s contestants, helping to find tools and materials, and assisting where I could. It felt good to get back downstairs after being out of it for so long and getting things done. My thanks to everyone who attended tonight, we got some good things done. Well, this sure has been a crappy month for me health-wise. Turns out my sniffles from Sunday became a really bad cold that has kept me out of the basement (and work) for several days now. The frustration is huge. We did have a small work session tonight, just David and Wayne showed up. I think most of the others were scared off by my cold, and I don't blame them. Wayne arrived right on time and got to work on de-roofing the roundhouse. After examining the way it was made up, wayne got to work on it with a #17 hobby knife and a pair of pliers, and within about a half-hour all of the old roof panels were history. He did a great job, with much less damage to the building structure than either of us expected. We lost a couple of roof braces, and broke one joint in the back wall, but really it went very well. We mixed a little epoxy and glued the walls back together, and he cleaned up a few spots with a sanding wheel and a dremel tool. Dave came down a little later, and I asked him to install a tortoise switch machine on the far switch coming into staging. This is the machine that can't be reached from the staging area, and will need to be remotely controlled. I think we will install a Hare here, and let it select the routing by detecting a train approaching it and throwing the turnout automatically to the proper route. That will simplift things a bit for the mole operator. Myself, in my weakened state, I put the new ready-to-run boxcars and reefers out on the railroad and also finished wiring up the frog switch on the last turnout in Standard Oil. We finished up early and I went to bed to try and sleep the cold off some more. I really hate being sick! Well, just got back from the big Springfield MA train show. We had a ball while we were there. Did some shopping, saw a few layouts while we were up in Massachusetts, and met up with a lot of friends. My primary goal at this show was to get more cars to put on the layout, and I think I managed well enough -- I got 14 ready-to-run boxcars and reefers -- some used but most new -- that can go on the layout right away, and another six shake-the-box kits that will hopefully get built up and rolling soon. That will certainly help fill out a few more trains during operating sessions, which is a good thing. On the other hand, it means a lot more large 36' boxcars that are out of period rolling around. Most will be replaced over time, but it looks like it is going to take a long time for that to happen. Ran into Marty McGuirk and Bernie Kempinski at the show, both of whom I count as good friends. 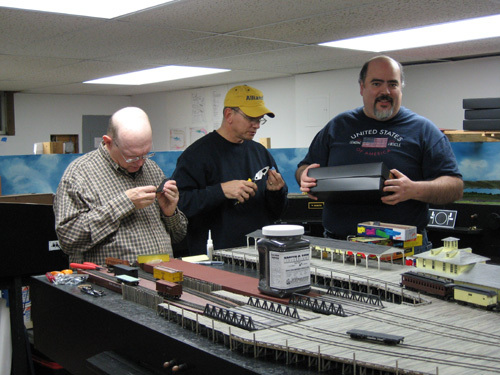 They took a quick stop on their way back to Virginia and came down to see the layout. I was really pleased to show it off to them and got a lot of very good tips and ideas from them, which we will try to work into things as we go forward. 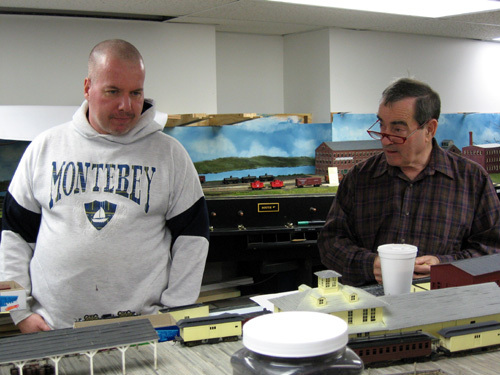 Both of them have had a hand in helping make this railroad work, from Bernie starting to make early-period rolling stock to Marty, who has helped find new information for me and even built a few models for me as well. I seem to have picked up a bit of a cold at the show, hopefully it won't get too bad, I have a lot of work to do! This week has been a little better than last. I’m finally sleeping through the night again and have regained my enthusiasm for working on the layout to some degree. To help motivate me to go downstairs, I’ve been working on a project I find interesting and exciting – getting the fast clocks and train order signals installed around the layout. The finished panels will be approx. 5” x 8” and tilt upward by 15*, and sit on the shelves we installed to mount the switch controls to. 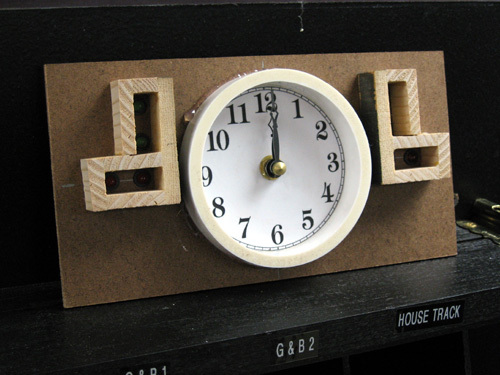 Once the design work was completed, I cut out a bunch of 1/8” Masonite panels to mount all the hardware to (clock movement, LEDs, enclosures). I also ripped a bunch of pine into quarter-inch strips and used them to build the light enclosures for the LEDs so they don’t spill over into the adjacent openings. That was kind of fun to build, now I need to cut them like slices of pepperoni, along with a length of 3” PVC pipe into 5/8” chunks. All these will get mounted to the Masonite panels, along with a paper clock dial and the clock movements. When it’s all done, a piece of 1/8” clear Plexiglas with a paper 'beauty' mask just under it will complete the main construction, and finally a wooden enclosure will be built for each panel. 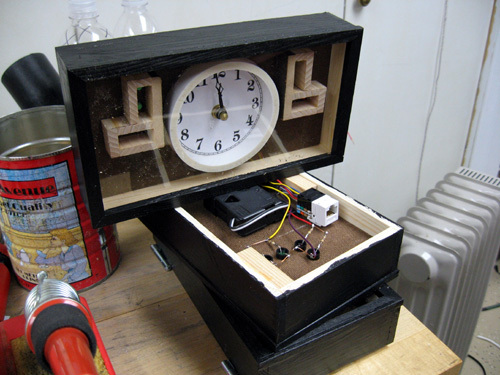 Monday night I modified a whole bunch of clock movements per Mike Dodd’s fast clock driver instructions. 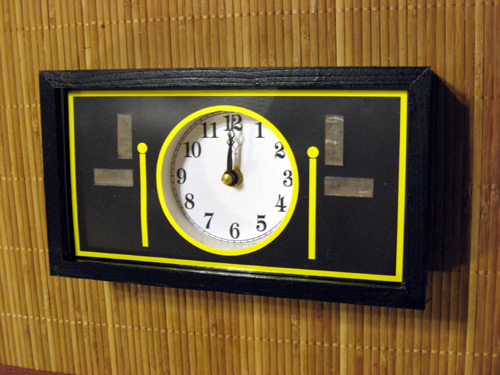 I expect to install a total of nine clocks (eight in the fascia panels described above) all around the layout. 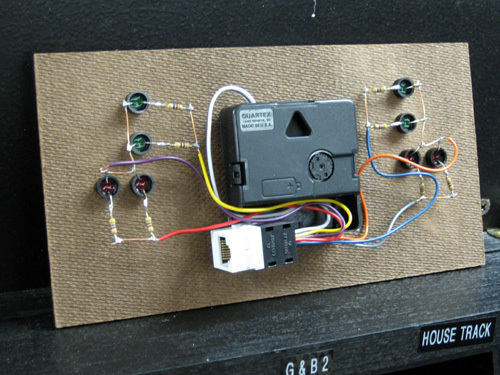 I hit on what I think is a great idea for wiring up the system – I’m going to use standard 8-conductor Ethernet network cables to connect all the clock panels to the controller. 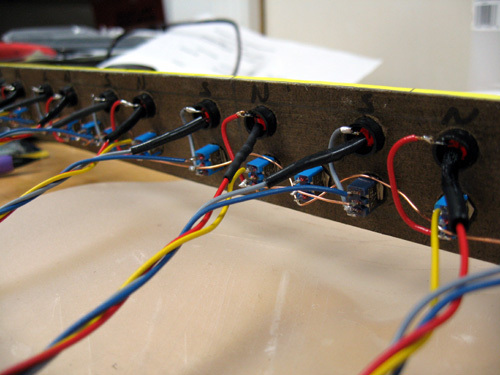 Reason being, I need 8 wires to drive the clock and four sets of LEDs on each panel (train order signals), so these ready-made cables will be perfect and fast to work with. 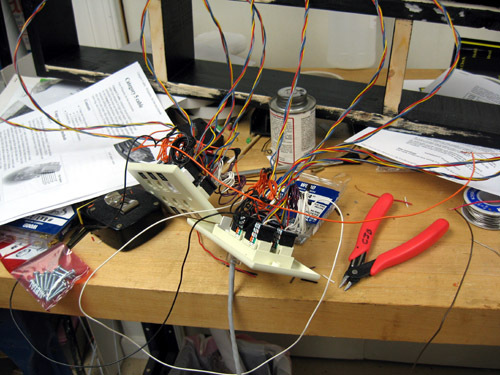 I’ll wire up the back of each panel with a RJ-45 socket, and an identical connector will go on the back of the operator’s control panel (where everything will be controlled from). 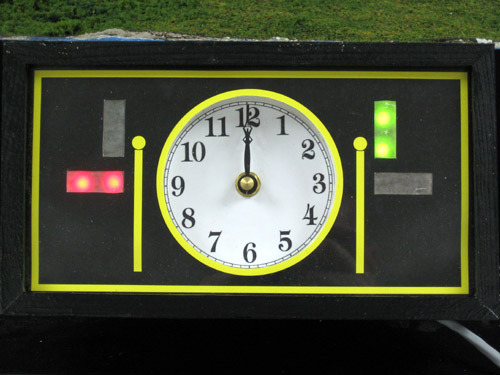 Each clock / train order panel will get plugged in separately. If at some point we need to move the operator’s panel all we need to do is swap around the Ethernet cables to fit the new configuration, there will be no specialized wiring to rip out and remake. I like that. 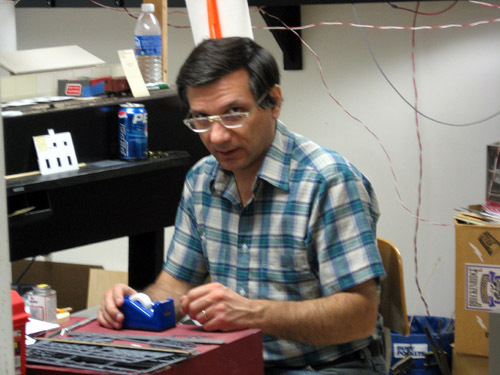 In other news I was fortunate recently to get the telephone system off the layout of an old friend who passed away some time ago, George Berisso. 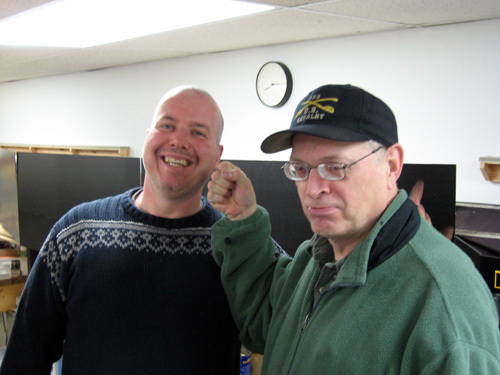 George was a great guy who got me involved in operations when I started out and met him at an LDSIG event. George, who modeled the Spokane, Portland & Seattle Ry., was a generous guy who had a layout that was great fun to run on, and his wife Jane graciously allowed us to continue running it for ten years after he passed away unexpectedly and before his time. Recently though it was decided that the layout had run its course and over the last six months it has been dismantled. I was hoping to get the phone system, and I’m very glad this part of the SP&S will live on with me. Well, it’s been a couple of weeks now since the last work session. Ordinarily I’d be posting about haw much has happened since the last update, but the fact is I’ve been dealing with a bout of sleeplessness and simply haven’t had the energy to get down to the basement much. I think I also have experienced a little burnout after rushing to get ready for the operating session. It's awfully hard to get motivated when you can't put two thoughts together in your head. There have been a few developments though. First, after the big Op session I came away with a laundry list of problems that need to be addressed and some of them are pretty involved. For instance, the switch machines under Dock Yard are not working out well and need to be replaced. That’s a really tough job, because there’s a ton of heavy lumber under Dock Yard that can’t easily be moved. And up on the surface, there are a bunch of low spots where the loco drivers lose contact with the rail that needs to be fixed. All of that work is going to take some time to correct. I have also begun working on the fast clocks and train order signals, which I would really like to have installed before the next op session. I may not have done much work on the layout, but I’ve had plenty of time to think. I believe I’ve come up with a good plan on how to build the panels, and how to wire them. I’ve worked out a system that should make them fairly easy to build with a minimum of cutting. It should also allow me to easily disassemble them if I need to change or maintain anything inside. 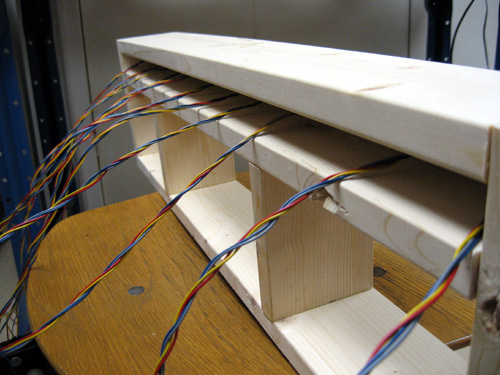 I’m even considering a modular wiring approach using readily available Ethernet network cables and connectors. But this also will take time to build and install. I have already gone through the Waybills database and made corrections to many of the ‘problem’ waybills that caused trouble during the session (really poor routing instructions, my fault, I was in a rush) and I’ve printed replacement waybills. I need to take a couple of hours and track down the bad waybills all over the layout and replace them wit the new ones. Thank goodness Waybills puts card numbers on the side of the waybill so I can easily determine when I find one that needs replacing. After the session Henry (who ran the mole yard) agreed that there was nothing wrong with the ground throws in the staging yard, that there was no need to replace them with tortoise electric motors. So I’ve decided not to fight city hall and leave them in place. We will still replace one or two of the ground throws that can’t be reached easily – fortunately these are the ones that are not going to be difficult to install. And I have at least a half dozen other important issues I must see to as well, like finding a way to keep the passenger cars from pulling off the tracks in the tight curves (Don Ball warned me but I did not listen), changing the operating plan to run trains through to Wilson Point (instead of Dock Yard) from the north, etc. I’m hoping to get some sleep soon so I can get back to work on the layout. Wish me luck. 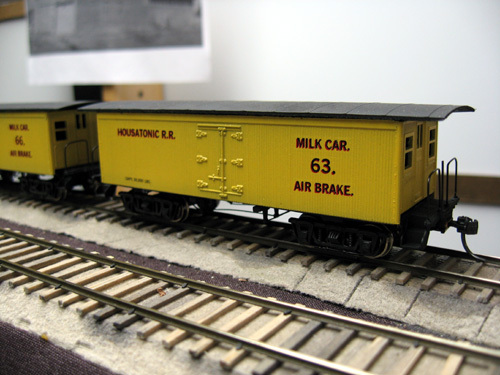 A little under the weather today, but I managed to finish up the work Wayne started yesterday with the milk cars. couplers & trucks, a few decals and the roof glued on -- they look pretty good I think. I'll need a few more eventually but these will be a good start. Still trying to get a couple more things done for tomorrow, but I don't want to push my health. Enough is done that it should be a good session. Happy New Year! We got off to a great start by having a vigorous work session which was very well attended. Ted was kind enough to offer me the night even though it was his turn in the round robin, and boy am I glad he did. We got a tremendous amount of work done tonight and I really needed the help to be ready for Friday's big operating session. 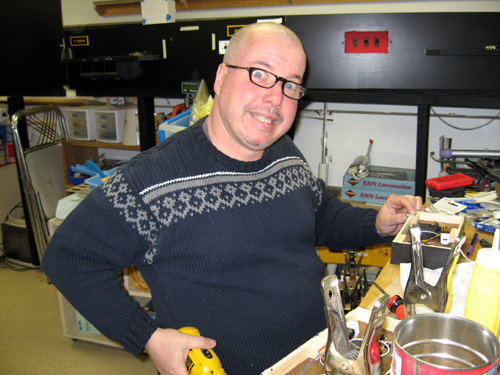 Ray Louis arrived first, and I set him to work on a number of small but very important jobs. 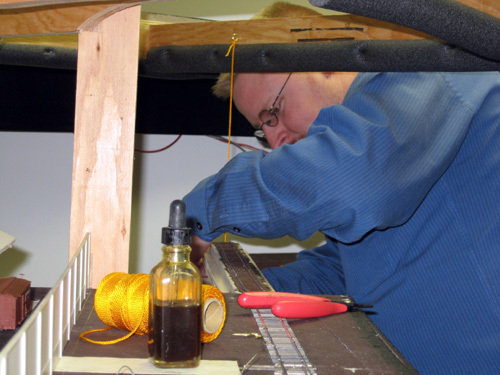 Wiring up the tail track at Standard Oil. Installing the last few feeders for the Holmes, Keeler & Selleck siding in Wilton. Installing the last few ground throws in staging. Making up a few extra throttle cables. I know there were a couple of other things he did too, which we desperately needed finished. Thanks Ray. Things were a bit of a blur for me after that. Wayne worked on getting the new milk cars assembled and installed weights in them for me. 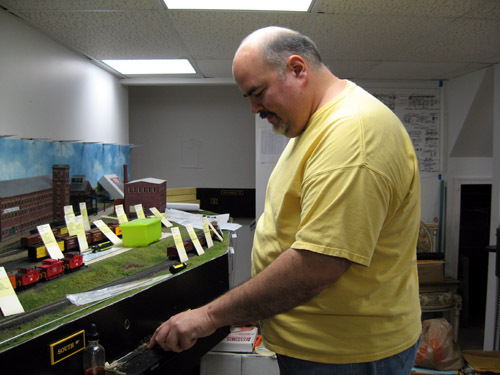 David unpacked and programmed the rest of my new 4-4-0 locomotives and later worked on getting one of the new switch machines installed under Dock Yard, which was no easy feat. Ted Pamperin jumped in and got two of the new fusee switches installed into nameplates and mounted on the layout, which really spiffed up the Georgetown fascia. Tom was a huge help, going around and starting to match waybills up with car cards and doing a bit of pre-staging cars here and there. And Scary Ted went over all the tracks with a track cleaning bar which was a big help too. We had time for a little testing here and there too. Myself, when I could I was underneath Standard Oil doing the final hookups and adjustments on the newly installed switch machines there. I'm really pleased that we managed to get this section open for the op session. It has sat there so long, unused, that I could feel imaginary weeds starting to grow up around the ties! Well, I still have some work to do before we'll really be ready for the operating session in two days, but I feel great about all the help I got tonight. These guys made a big difference in the layout that will really show up in a couple of days. I'm still feeling anxious about the session, but not nearly as I was last night. I think we're going to have a really good time.